Larger than anticipated, But still A Great Purchase. This elegant Burgi watch will bring class and style to every outfit. It features a beautiful etched patterned bracelet and sleek hands. The sparkling genuine diamonds on the mother of pearl dial and crystals on the bezel make this timepiece shine. Wow!!! What a beauty. 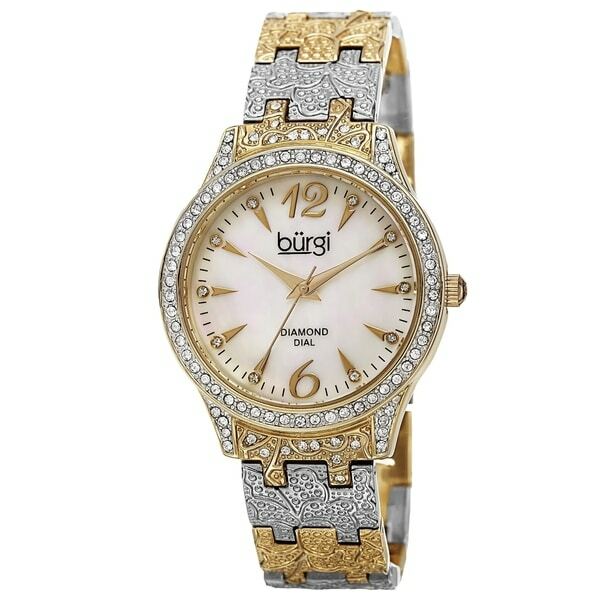 The picture definitely does not do this Burgi Women's Diamond Marker Mother of Pearl watch any justice. You'll be delighted with the intricate design of its two toned wrist band, which has a removable clasp for smaller sized wrist (a nice feature). The watch is elegant. I will wear it on special occasions, with its diamonds around the face, and distinct numbers at the 12 and 6 dial. This is definitely a favorite and a great piece for any watch lover. I will put this watch at the head of my collection and one that I recommend to other's. I plan to enjoy long lasting quality and style with this brilliant piece. I recommend it to family and friends. When I got my watch, I was very pleased. It is absolutely beautiful and very classy. I have never owned this brand, but will buy more of them. After viewing the watch on the brands website, I was amazed at the price they listed compared to overstock. Love the cost! Beautiful watch! Not too big or small. Looks great on the arm! You won't be disappointed!! Have received so many compliments. The mother of pearl dial is just beautiful! 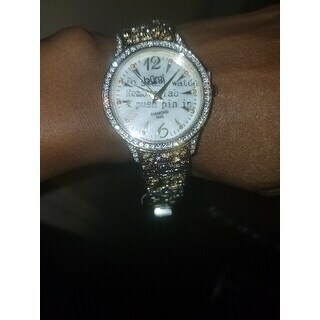 This watch can be dressed up or down, and I wear mine everyday!! ll I can say is 'WOW!" This is truly the most beautiful watch I've ever seen. Its sparkly presence dresses up any outfit and having both gold and silver goes with any of my other jewelry. I did have to get several links removed as it was large on my small wrist. It now fits very well, and I'll treasure it always. This is a heirloom piece of jewelry, not just a watch, and I can't express how glad I am to have purchased it.. The face of this watch is quite large. It is heavy to wear. The band is quite pretty, it looks like a nice bracelet. I did have to take it to a jeweler to remove some links as it was too large for my wrist. The clasp can be difficult to get on or undone as you must support it underneath while unsnapping. Love, love, love my Burgi watches; crystal clear face, lovely color and design, keeps great time and love the bling! The watch is just what I was looking for a very long time. It looks expensive and very classy. You can actually do much with this watch. You can dress up and dress down. Use for any occasion. I had so many compliments. Thanks for bringing such a great looking products. I recommend it to any one who want a good looking wrist watch. Thanks so much. The watch is BEAUTIFUL!! !...I love it and I have received so many compliments when people see it...It sparkles all the time...It is the perfect size and YOU CAN read the numbers on the watch...Thank You! Little heavier than I expected, but I love the watch....I can see the numbers easily. This is a very beautiful watch. I use it as my favorite formal go to watch. Love the finish on this beauty. The watch is nice but too large for my wrist, therefore, I am returning it. It looks wearable with dressy or casual attire. Also will coordinate well with silver or gold jewelry. I like the texture of the band and the face of the watch with the diamond markers.